SAN FRANCISCO, Jan. 16, 2019 /PRNewswire/ -- Outdoorsy (outdoorsy.com), the world's fastest-growing outdoor recreation marketplace powering road trips and recreational vehicle adventures, and Aviva Ventures, the corporate venture capital fund for Aviva Plc (LSE: AV.L), announced today that Outdoorsy has raised $50 million USD in Series C funding led by Greenspring Associates. The round includes continued participation from Aviva Ventures, Altos Ventures, AutoTech Ventures and Tandem Capital. John Avirett, General Partner from Greenspring Associates has joined the company board as a Board Observer. "We are interested in marketplace technology companies that challenge the status quo and create seamless experiences for both owners and enthusiasts, which is exactly what Outdoorsy has done," said Greenspring Associates' General Partner, John Avirett. "Most people buy an RV that's unused nearly 97 percent of the year. We appreciate that Outdoorsy is unlocking these expensive assets for owners and making them available to the millions of travelers around the world who crave experiential travel without the burden of ownership. We feel strongly that with Outdoorsy's proprietary technology, suite of premium services, world-class team of engineers, and forward-thinking workforce, the company is set to become the global leader in the recreational travel market." Over the last three years, the company experienced exponential growth with a 400 percent increase in bookings through the platform and more than a quarter of a billion dollars in transactions. Headquartered in Austin, Texas with additional offices in the U.S., Canada, Australia, France and the U.K., Outdoorsy is currently in eight countries worldwide and will see continual expansion into new markets this year. "We are off to a terrific start in 2019," said Outdoorsy CEO Jeff Cavins. "Our business is growing fast across all geographies and across both our owner and renter base. We've also significantly reduced our insurance and operating costs, which has contributed to our global leadership position as a peer-to-peer and professional fleet management platform. Given the size of the opportunity ahead of us and our goal of making Outdoorsy a global outdoor experiences marketplace, we will invest more aggressively this year, both in international markets as well as expanding our platform to include campsites and outdoor travel experiences." With a generational shift, particularly among millennials, in valuing experiences over things — matched with an increased desire for 'authentic' local experiences — the sharing economy is now embedded in how we travel. "Outdoorsy is reimagining the world of outdoor recreation and the lifecycle of RV and campervan ownership," said Aviva Ventures Managing Director Ben Luckett. "Through the Outdoorsy platform, we are able to provide embedded insurance offerings and premium services whilst removing much of the pain associated with recreational vehicle rental. The customer experience will be much simpler and much cleaner. As existing investors, we have seen Outdoorsy scale rapidly and expand their offering in a way that aligns with the vision we have for our customers and we are excited to meaningfully increase our investment in this latest financing." Proprietary research conducted by Outdoorsy in 2018 found that Americans place high value on experiencing new things, noting that experiences are vital to their happiness ahead of material possessions. For nearly half of those surveyed, RV travel — and the freedom and adventure it embodies — represents the preferred form of pursuing these new experiences. 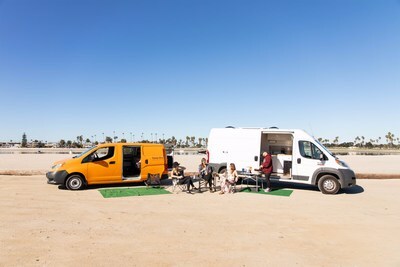 The intersection of the experiences economy with the evolving lifecycle of RV and campervan ownership provides a wellspring of opportunity for Outdoorsy to make available the millions of campervans, RVs, motorhomes and travel trailers for the millions of consumers who seek adventures and the outdoors. For more information on Outdoorsy, visit www.outdoorsy.com or the Never Idle Travel Journal. Headquartered in Austin, Texas with additional offices in the US, Canada, Australia, France and the UK, Outdoorsy is the world's largest and most trusted, on-demand marketplace for recreational vehicles, with hundreds of thousands of rental days and the fastest growing global fleet of unique outdoor vehicles. Outdoorsy provides a gateway to the experiences economy by mobilizing the over 18 million idle RVs around the world, ensuring everyone has the access, choice and opportunity to safely enjoy outdoor recreational vehicle travel while empowering RV owners to realize life changing financial benefits. From finding a house-on-wheels to adventure-equipment-you-can-sleep-in to SUVs with roof tents and all the equipment you need during the trip, Outdoorsy is the broadest range platform for outdoor accommodations and experiences. Aviva Ventures, the corporate venture capital fund of Aviva plc, aims to invest £100m by 2020 in early stage businesses worldwide. With offices in the UK, France and Singapore, Aviva Ventures targets investments in digital and technology companies operating in four areas: 'the internet of things' including connected homes, health and automotive; data and analytics; innovative customer experiences; and distribution such as new 'sharing economy' platforms. Greenspring Associates was founded in 2000 to focus solely on venture capital investments. Through a comprehensive platform, the Firm serves as a lifecycle partner for entrepreneurs and fund managers, investing across multiple stages, sectors and geographies. An established investor in marketplace technology companies including Grubhub, Woowa Brothers and TheRealReal, Greenspring Associates manages over $8.7 billion in committed capital across a variety of specialized venture strategies. For more information on Greenspring Associates and a full list of its prior investments, please visit its website at www.greenspringassociates.com.